Towards Functional, Beautiful AND Affordable Masonry Heater Construction…. In our continual search to come up with functional, beautiful AND affordable solutions for sustainable living, we are very excited about and currently experimenting with the use of Compressed Earth Blocks (CEBs) for masonry heater construction.� As natural builders, we decided that masonry heaters provide the very best solution for heating homes.� It is the cleanest and most efficient way to burn wood which we consider to be a vital renewable source of energy in comparison with alternatives such as natural gas or electricity which come from more abstract and complex sources. 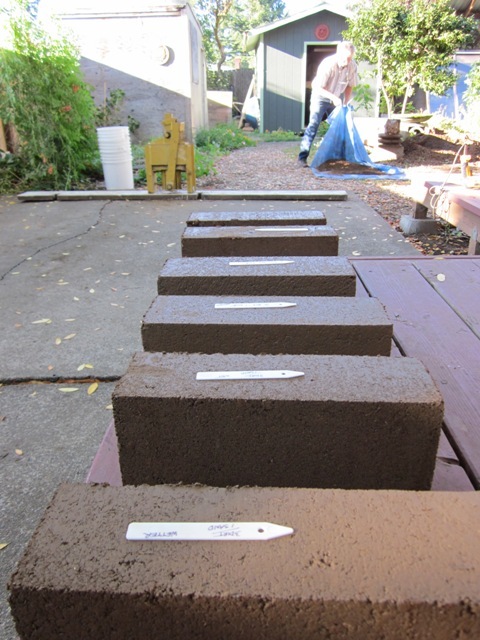 We love using earthen materials because of how sculptural they allow us to be, how healthy we feel using the materials compared to others and because of their low embodied energy.� We have been experimenting with using cob and adobe for masonry heaters and have found that both leave room for desired improvement in their thermal capabilities. Cob does work well for rocket stoves but it is still not the perfect dense material that we want to be storing the heat generated by the flue gases traveling inside masonry heater channels.� The denser and heavier the material, the greater the rate at which it can transfer the heat from the gases passing by its inside surface towards it outside surfaces. CEBs allow one to make bricks with a very dry mix.� When using a press like a CINVA-Ram… one notices that whereas water is usually what gives clay its cohesiveness…. the compression that results from using leverage� mixed with only a very little bit of water activates the binding quality in clay and makes strong unfired bricks (also know as “green” bricks).� Because there is not so much water in the mix, the density of the material does not change so much in drying. We are currently beginning experiments with producing and using CEBs for masonry heaters and look forward to sharing these experiences..
For those interested in really going deeper into the subject…. follow this link to a thorough and thoughtful guide to making CEBs. Rammed Earth Construction, Sustainable/Green/Natural Building, Using Local Energy, Using Local Resources, Ecological Responsibility, Fireplaces, Adobe, Cob, etc.